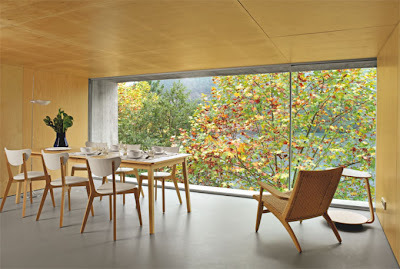 Casa no Geres, designed by Porto-based Correia/Ragazzi Aquitectos, has received its fair share of international awards and exposure, but we cannot help but show it off one more time. 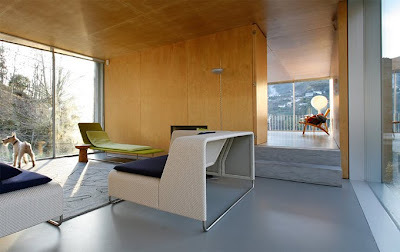 This is the first project by Gracia Correia and her new Italian partner, Roberto Ragazzi. It is a bold statement that hides nothing. This is also a house that is easy to love from certain perspectives and from others; it looks quite unsuitable for its surroundings. From some angles, the house seems like an accident, some kind of a mishap with transportation containers and building materials. 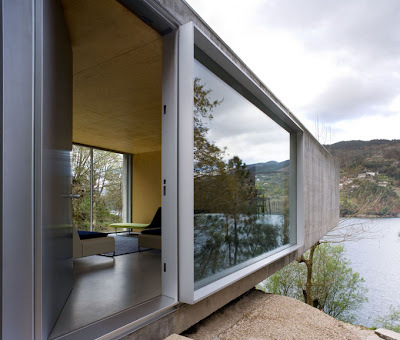 One part of the building is buried inside the hill while another sticks out over the river. 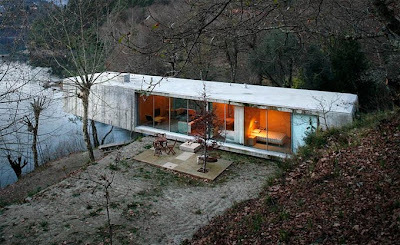 It appears about to teeter The owners, Mica and Eduardo Pinto Ferreira, have been Correia's clients for more than a decade, and gave her carte blanche to create their dream house on the 5,000 square-meter site by the Cevado river - as long as no trees were cut and the 60 square-meter house (maximum allowed footprint for the site) was made of concrete. 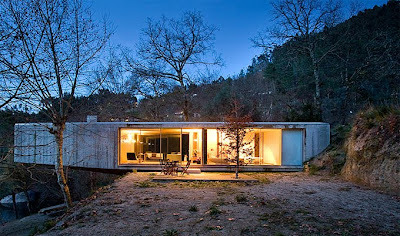 The house is located in Peneda-Geras National Park, along the Spanish border in northern Portugal, so the environment and its inviolability were crucial and the rules strict. the hill at any moment, just waiting to land in its final resting place in the river.